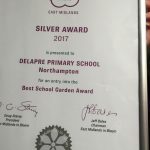 Eco-Schools Programme | Delapre Diggers win Gold Award at Northampton in Bloom! 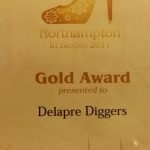 Delapre Diggers win Gold Award at Northampton in Bloom! 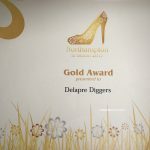 The whole school is incredibly proud of our Delapre Diggers green-fingered children who scooped a Gold award in ‘Northampton in Bloom‘ and a silver in ‘East Midlands in Bloom‘! Children and adults attended a ceremony at the Guildhall in October to receive their awards. 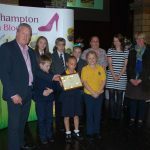 Huge Congratulations to our gardening club. Special mention to three wonderful ladies who make it possible – Sarah Gordon, Alison Feetham and Alice Whitehead. A huge amount of work undertaken this year by all and it’s been wonderful to see the whole school getting behind them in support. 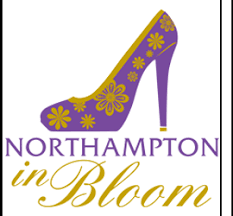 Exciting news: being part of Britain in Bloom next year – AMAZING!